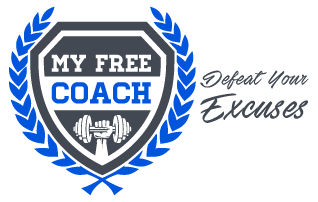 While this blog is a place to find info on free coaching for your workout program, I thought I’d take the time to introduce myself and tell you a bit about me by giving you a little background on what made me decide to become a fitness coach. My name is Dan Clark. I’m 41 years old and, although I am still on my weight loss journey, I am in better shape physically than I was over 10 years ago. What many people don’t realize is that, even though you may not APPEAR to be gaining weight, you may be setting the precedent for those fat cells to start piling on very soon. I started driving 18 wheelers at 23 years old. Sitting behind the wheel of a truck for 10+ hours a day definitely creates a need for physical activity. Once I got out from behind the wheel and started working behind a desk, the damage had already been done and I spent years sitting and becoming more and more unhealthy. I had seen the P90X infomercials while lying in bed, snacking on something before trying to fall asleep. It looked very intriguing. It was a couple years later when I started hearing about it more often and then started seeing friends posting on Facebook that they were having great results from it. Then, on June 18, 2010, my wife and I attended our son’s 8th grade graduation. 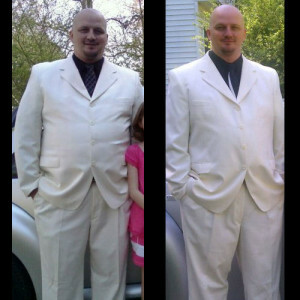 Upon getting home and looking at the pictures, I realized I was bordering on morbidly obese at 340 lbs. The other push factor here was the fact that my size 42″ waist pants and shorts were getting too tight. I saw yet another Beachbody infomercial for P90X and decided to go ahead and do it. My thought process here was, “I sit on the chaise for hours on end each night, I can afford to get up for ONE of those hours and get a little exercise in.” The workout program arrived, and I began on June 30, 2010. I didn’t follow the nutrition plan at all for that 90 days. I think the only change I made in my eating habits was about 2 months in, and that was simply making my sandwiches with a lettuce leaf rather than bread. It was actually pretty tasty. Upon completing that first round of P90X, I was down 25 lbs. Not bad for not changing what I was eating and, in all honesty, slacking on the workouts because I had been in such poor shape when I first started. While continuing to workout (I started P90X again immediately upon completion of the first round), I was also now playing softball. Two weeks later, I pulled a calf muscle while running the bases during a game. This severely limited me over the next 2 months while I recovered. The difference now, though, was that I was more conscious of what I was eating. With Thanksgiving and Christmas falling into this time period, I gained 8 lbs. It also took me awhile to get back into the swing of things as I had been not working out during that time. I decided it was time to step it up and really focus on my health. I purchased Insanity and was ready to get started on January 8, 2011. At the same time, I now had a workout partner. Once a week, a friend and I would meet up and workout together. The first month was tough, but I was ecstatic about my results so far. In the first month, I had lost another 11 lbs, and about an inch and a half from my waist. I pressed forward into month two and thought I was going to die after that first day, but I pressed on. Upon completing Insanity around March 12th, I had lost a total of 26 lbs, and 4 inches from my waist over the previous 2 months. Grand totals were 43 lbs gone and 6 inches off my waist. I’ve basically toiled with different workout programs since then, not having fully committed to just one program since. It was soon after completing Insanity that I finally broke down and decided to see if I could fit into my size 38″ waist shorts again. I was afraid to even try, because I didn’t want to be disappointed. They fit perfectly! My current goal is to let them last until I can fit back into 34’s and I know I’m getting close because I can’t wear the 38’s anymore without a belt. You’ll see my before and after photo below! This lifestyle change is so much more than I ever expected! I look forward to my workouts each day and get thoroughly disappointed with myself if I don’t workout. My own coach has been a HUGE motivator and assistant throughout my journey and is ultimately the main reason I decided to become a coach myself with a desire to help others like he had helped me!